Research "Web Development Market and Careers in the USA"
(PRLEAP.COM) April 14, 2016 - The Analytics Department at TemplateMonster has accumulated and processed a large amount of data related to the state of the web development market and careers in the USA. The data has been compiled into the research and interactive infographic"Web Development Market and Careers in the USA". Key Requirements for Web Developer. According to the findings of TemplateMonster's analysts, there were 249,097 companies and 121,020 people working in the web development market across the United States as web developers, web designers, and related professionals. An average web developer is a male working full-time with a mean annual salary of $68,670 and a bachelor's degree in information technologies field. Gender-wise, there are 82% of male web developers versus 12% of females. While 83% of developers work for companies, 17% are self-employed. The geographic location has a huge impact on wage rates for web developers: the highest-paid positions are found in metropolitan areas, namely, San Jose, California; San Francisco; and Seattle. 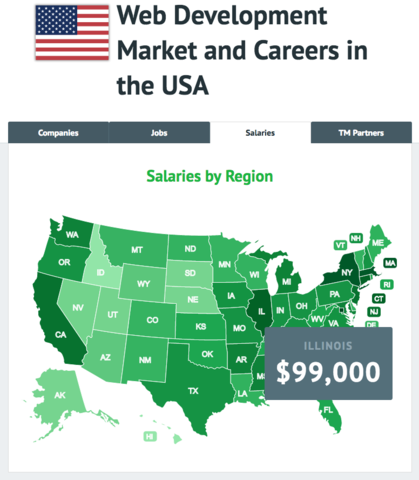 TemplateMonster reports that average salary ranges for web developers in the USA have increased by up to 13,59% during the last two years. Last year, the overall annual income of Web Developers fell within the range of $73,500 – $122,000 depending on individual performance. In the meantime, web development specialists earn a bit less than most of their colleagues in IT-field as analysts discovered. With a mean annual salary of $68,670, web developers earn more than computer support specialists whose annual average wage is about $66,140. At the same time, web developers make less than network and computer systems administrators ($79,770) and less than computer systems analysts ($87,320). New York-White Plains-Wayne, NY-NJ: $79,900. Analysts found out that relevant experience and working time in the web development field have a direct impact on salaries and compensation packages. Newcomers to this profession can expect to earn an average of $50,000 (not counting bonuses and perks). Experienced specialists who worked smart from 5 to 9 years can increase their income (by 14%) up to $61,800. After 10+ years, web developers could increase their salary by 30% and earn an average of $72,300 annually. Professionals with 15–20 years of experience make $80,000–$81,000. As reported, 5% of web developers in the USA have less than 1 year of experience. Slightly more than half of them (52%) have been working in the field for 1–4 years and 26% of them have been employed for 5–9 years. Professionals with 10–19 years of experience constitute 15% of the group, and only 1% have more than 20 years of experience. Today, companies and organizations have come to rely on online as a communication channel with their customers, partners, and employees. Therefore, the employment of web developers in the USA is expected to grow much faster than the average for all occupations. As of 2015, there were 249,097 companies that have been proactively recruiting web developers. Online purchasing in the USA is expected to grow faster than the overall retail industry. As retail companies expand their online offerings, the demand for web developers will increase. Besides, an increase in the use of mobile devices and the expansion of mobile web will lead to an increase in the number of vacancies for web developers. Job opportunities for web developers are promising. Those with knowledge of multiple programming languages and digital multimedia tools have better chances to land the job they want. In some states, web developers may want to move from one state to another with higher wages and lower rental prices, decreasing employment growth in the particular state. San Francisco-San Mateo-Redwood City, CA Metropolitan Division: 3,380. For most candidates, key requirements for landing work as a web developer are quite simple: digital portfolio with live web pages, websites or applications, and a set of programming, web design, and database management skills. Almost half (43%) of all web developers working in the field have bachelor's degree while 20% have an associate degree, and 13% have the post-graduate certificate. Computer systems design and information service industries employ the largest share of Web developers. An average web development company is usually a small Web Shop or Studio with an average cost of a project of about $2500 and 5 people involved. Besides, many web developers can work alone or remotely in teams, and many of them are self-employed. TemplateMonster statistics, Robert Half Technology Salary Survey - 2015, 2014 & 2013 Editions; U.S. Department of Labor, Bureau of Labor Statistics; Indeed.com; 2015 IT Skills & Salary Report by Global Knowledge and Windows IT Pro. TemplateMonster is one of the world's leading manufacturer of ready-made templates for the development of websites of any complexity. When working on website design, the company's specialists comply with the world's highest quality standards and consider the latest trends of the web-development market. As of today, the number of products in the company's catalog of templates and ready-made websites has exceeded 26,000 units.